With the release of EasyPower 10.0, you can now use the Custom One-line Text feature to improve your productivity when designing system one-lines for your clients. When building one-lines, system designers may need to see a different set of equipment information than the normal text descriptions that the program displays. EasyPower lets you use different one-line text templates to accomplish this. For instance, when laying out a new system one-line, you may want to see the cable ampacity displayed as you add loads. Use the following steps to create a layout template to include this parameter. You can select to use the template as needed. Open an EasyPower one-line, select Tools > Options, and then select One-line Text. 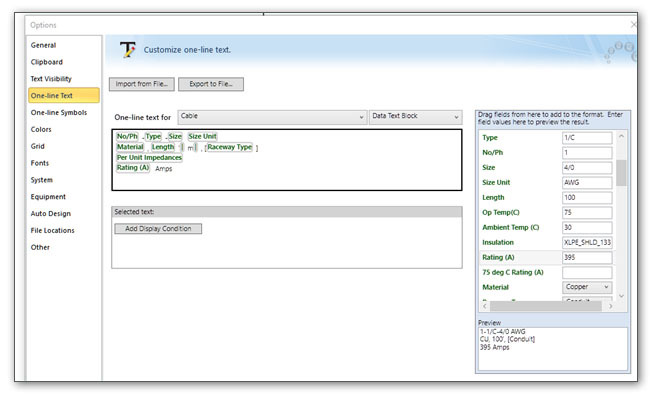 This dialog box enables you to customize the text displayed for the various system components. For this example, we just want to modify the settings for the cables. Next to One-line text for, select Cable. The upper box displays the current selection of parameters in use for cables. To display the ampacity rating, scroll the list of fields on the right to find Rating (A). Drag Rating (A) to the upper box where you want it to be displayed in the text. If you want the ampacity rating to be displayed by itself as the last element in the text block, position the cursor (indicated by the short red line) just ahead of the Rating(A) tag, and then press ENTER. This moves the new parameter down to a line by itself. To display the term “Amps” after the parameter, type Amps on the same line. The Preview pane in the lower right displays how the text will appear on the one-line. The preview sample data comes from the boxes on the right. Click Export to File to save the template. Use a name that will make sense to you later. For this example, we’ll create a file called Layout Template and we’ll save it in the Templates directory. 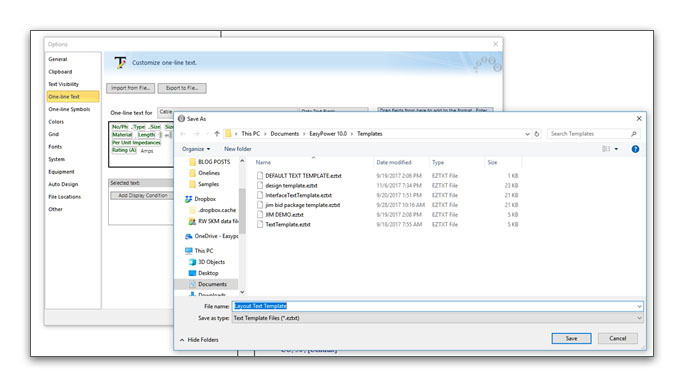 The file is saved with an .eztxt extension to indicate it is a text template file. Important: We recommend that you do NOT use the name of the default TextTemplate.eztxt file. This enables you to reimport that template later if you want to recover the original default text settings. When you are ready to design your system, you can use the One-line Text tab to import the Layout Template.eztxt file you created. This lets you see the cable ampacity displayed on the one-line as you build your system. When you are ready to generate printouts and present the one-line to your clients, you can import the default TextTemplate.eztxt file first to display the original one-line text without the cable ampacity.